Rubi was born with only half of her left arm. Because Rubi was born missing part of her limb, she learned to perform most daily living activities as a child, but the only work she was able to find as an adult was either staying at home caring for children or cleaning other’s homes. But because of her disability, Rubi could not find or keep work. In July of 2012, Rubi started in the Work Adjustment Training (WAT) program at Goodwill. 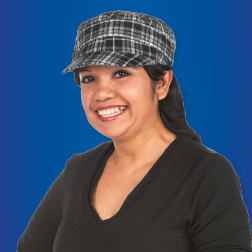 Rubi credits Goodwill with her success and her future possibilities.